Global research has shown that only half of enrolled master’s and PhD students actually finish their studies. Around 40% of the same group battle with mental illness such as depression and anxiety. Coincidence? Laura Weiss thinks not. Dr Laura Weiss, a postdoctoral researcher at Optentia research focus area on the North-West University’s (NWU’s) campus in Vanderbijlpark, recently received first prize for a presentation on her theories on positive psychology and postgraduate students. This was at the first Postdoctoral Conference that was hosted by Stellenbosch University. During her time as postdoctoral researcher at Optentia, Dr Weiss worked with a group of more than 20 master’s and PhD students and supervisors across all three university campuses. Her postdoctoral research aims to develop an intervention to assist members of this group to cope with the challenges that come with postgraduate study. These challenges include the combination of stressful studies and a full-time job and social and other responsibilities such as being the first one in a family to study at a university. This is not the first time that Dr Weiss has embarked on bringing change to people in a vulnerable situation. She holds two master’s degrees - one in learning psychology and another in positive psychology. In the latter her research focused on acceptance and commitment therapy for people suffering from chronic pain. Her PhD focused on improving the well-being of people in vulnerable groups. For her PhD she worked with people living in social isolation due to mental or physical ailments, implementing an intervention called the “Happiness route”. This intervention helped people find their passion – no matter how small, for instance knitting – and to actively spend time pursuing it. Respondents in her study received a budget to spend on their pursuits and the results were significant. They started connecting with others again and visited the doctor less, indicating an increased well-being. 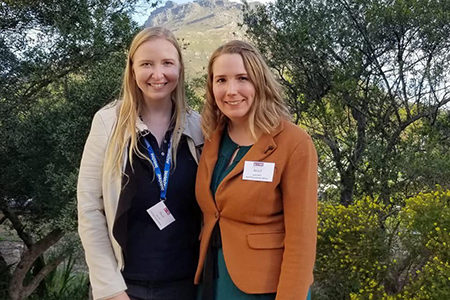 Dr Laura Weiss (right) and her colleague Dr Lara Roll, also a postdoctoral researcher at Optentia, while attending the Postdoctoral Conference in Stellenbosch. Laura Weiss was born in Hamelin in Germany. Before moving to South Africa to complete her postdoctoral fellowship, she was living in the Netherlands. She completed her master’s degree and PhD at the University of Twente. She was on the lookout for her next big opportunity, thinking about Ireland or Denmark, when she heard about Optentia and the work that this research focus area is doing in the African context. She found it to be a perfect fit, especially since it linked so well with her interest in positive psychology. She describes Optentia’s work as doing research that matter. Laura’s husband, Frank, made the bold intercontinental move with his wife and he now works as an IT solutions architect in Johannesburg. The best part of the couple’s South African experience has been the people. Laura says they have been touched by the friendliness of South Africans and that her colleagues have become her family. “We have literally been invited to people’s family homes for Christmas!” she smiles. What is next for Laura Weiss? Another year in South Africa finishing her current research, after which she will continue her work changing the lives of the vulnerable in yet another part of the world.